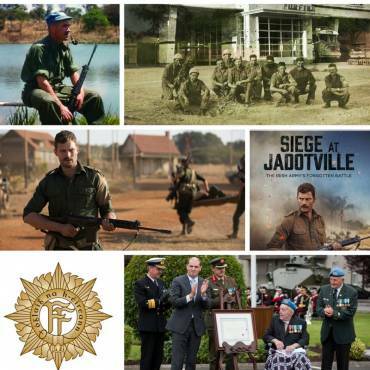 What a year it has been for Siege at Jadotville. We have seen the momentum build to the point where Jadotville has grown legs taken on a life of its own. Having seen this project grow from its humble beginnings, Jadotville has a special significance for us. When Declan Power wrote Siege at Jadotville, achieving political recognition for what he believed to be an important episode of contemporary history was at the forefront of his mind. It has been extraordinary to witness how much traction this has gained since then. This goes beyond the social media storm the Netflix adaptation to film has created. Real recognition has been gained for these men : from the Unit Citation in September to the Jadotville Day celebrated in Collins Barracks in October. Moreover the Netflix film has brought the story of A Company’s bravery to an international audience. When we first published Siege of Jadotville in 2005 nobody could have predicted that the story would have such international appeal. It is now available in print, ebook and audiobook format across the world. The hype around the involvement of Jamie Dornan can’t have hurt. Ultimately though the story of an underdog holding out against remarkable odds is universal. 200 Irish peacekeepers stood their ground against an adversary 20 times their size and remarkably did not lose a single man ; that is a story that lends itself naturally to film. Richie Smith deserves credit for taking a personal interest in telling the story right. Siege at Jadotville has sold out in many bookshops but some copies are still available on Amazon.